There were too many great photos in this challenge, but that's exactly what we want to see. Thank you all for participating and hopefully we'll get even more in the next challenge. Bruce Clark: masked, hollow eyes, good shot, it lets you imagination go. Pretty cool with the "bokeh" eyes. Arjay Bee: excellent insect shot, focused so perfectly on the eyes, nice job. And the other "smile" shot is a killer candid! Vaskebjorn: Larry the Lizard, I would have never guessed it was through a glass. Larry is giving you the eye, and it's nice and focused, with a beautiful bokeh behind him. i_trax: Lily certainly has big wide open beautiful eyes, something really had her attention. Excellent job for 1/10 second, she really was interested in something. devouges: Superb owl photo, straight on look with both eyes, I think he was looking at you as possible prey. atupdate: Moe is a good sport for putting up with that, nicely done, it's hard to to shoot those black eyes on a black dog, even if they aren't wearing glasses. dave2k: I agree that is an interesting color, but nature is often surprising with eye colors. Our cat Fester's eye seem to change color depending on the light, our other cat Emmie's don't. This is a great unusual angle on this bird too. tessfully: What a great portrait of Tripper Dawg, beautiful eyes, so well exposed, I assume it's snow in the background. I know this is an eye challenge, but I can't help but liking the little water droplets on the chin. jchorst: What a killer shot, not much to say, it's just great! That's a treasure that should be framed. captainhook1969: Lady Bird's eye is nicely in focus, which draws you right to the eye. Tamia: Wow, the snapper has some interesting eyes, part of the whole natural camouflage I assume. How big was she, I've seen them where the head was golf ball size to bigger than a baseball, that's a big scary turtle. Great photo! slowpez: What beautiful eyes the lion has, such a nice crisp photo, I like your framing or cropping composition to really accentuate the eyes. charliezap: Those beautiful eyes really stand out on the black cat, which really stands out in the snow. Beautiful photo, I love the composition. sealonsf: Quite a few eyes in this urban art, but the third eye on the man is interesting. bluestringer: Fabulous detail on this colorful dragonfly. Those eyes are really sharp. Great job in getting that close, with those eyes I'm sure the dragonfly saw you coming. amontilado65: You never know what you may find in the woods. Nice job of framing the eye through the branches. fstop18: Cute stuff, looks like she may be imitating you! Sqideyes: Those eyes really stand out, perfect use of the natural light. Is that a photo pose, or a "not again" glare? Rense: That is so sharp it looks like it's walking off the screen. Those eyes are piercing. photolady95: great timing, by the intense look in the eyes and body languge, this hawk is about to attack the next meal. geomez: Great shot, the focus on the eye and and shallow dof really works here. I like it better looking at it full size on Flickr. Ychemerys:That really a creative self portrait and really shows the eyes off well, good stuff. jacamar: I didn't expect anyone to do this one, but I'm glad you did, very well done, nice details in theat wing. Hattifnatt: That is one tiny cat or one huge mousepad, but the cat has some big beautiful eyes! Really sharp too, well done. rod_grant: Cool dude indeed, Now that's attitude! Bill E Z: That's cool also, interesting eyes there. noelcmn: Great photo, a really different look than we are used to of a zebra. I think the zebra can see you over his shoulder, nice job on that eye, and look at those eyelashes! Great Bokeh too. Will in Seattle: That is a priceless shot! garethjmorgan: Interesting art and I can see how the colors and eyes drew your eyes to it. Aslyfox: Owls have incredible looking eyes and to get a reflection of the a building in the pupil is a nice bonus. 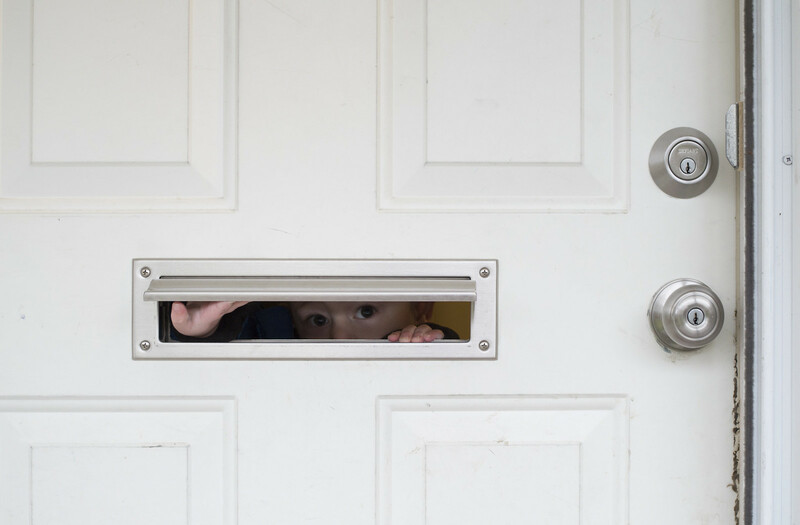 The Winning photo is the Boy Looking though Mail Slot photo by Will in Seattle. The creativity of the photo is great, and the attraction of the eyes nailed the theme. Will, you are up to present the next challenge with a topic of your choice. Honorable mention in no particular order goes to Hattifnatt, Ychemerys, geomez, tessfully, jchorst, and Tamia who also get the bravery award. Love that winning shot! Congrats to Will in Seattle. Great job judging too - thanks. Great shot Will and congratulations on the win. Kudos to the HMs. Thanks for all the feedback ramseybuckeye. Congratulations Will on a really wonderful take on the theme. Congrats also to Hattifnatt, Ychemerys, geomez, tessfully, jchorst, and Tamia on their entries. Hats off to ramseybuckeye for a great theme and a for commenting on everyones photos. Great winner, congrats Will! It´s a marvelous shot! What a fabulous shot, so many elements to appreciate here-top notch creativity, some mystery and the eye is just drawn to the mall slot and that eye. Worthy winner, congrats Will. And the HM's Hattifnatt, Ychemerys, geomez, tessfully, jchorst, and Tamia. Wonderful challenge, so p[leasing on the eye to see the various interpretations. Thanks Tom for that, and the judging and commenting exercise, as always appreciated. Well judged and good comments on all images. A great number of great shots, I am glad I did not have to chose one out if this lot. Congratulations to the winners and honourable mentions. A winning shot, Will -- Congrats! Very imaginative and captivating. Congratulations to the HMs, too. Such wonderful photos in this contest's line-up. You chose a really good theme, Tom. Thanks for that. Loads of wonderful entries, and you did a great job sorting through them all. Thanks for the bravery award. Mama Snapper was very docile with me. I'd helped her across the road -- she was about the size of a small truck tire -- and then shot her photo before she and I parted company. Hopefully she went on to become mother to hundreds. Last edited by Tamia; 02-19-2017 at 08:10 PM. When I saw it I thought, yep there is the winner. Congrats to the honorable mentions too. And thanks Tom for the comments on mine. Since she was staring at me, my first thought was, I might be her next meal. Wow - thanks everybody! There were some fantastic shots this week, so seeing my name was both a surprise and a good confidence-builder as I'm still a bit of a beginner. This was a photo I had been meaning to take for a while - it's a cute little moment I regularly get to see as I arrive at home - and this challenge was the prompt I needed. Thanks again! Congrats to all.Especially: Will in Seattle,HM's,ramseybuckeye. Last edited by eva; 02-20-2017 at 01:38 AM. Great shot Will, thanks to Ramsey for the considerate comments and for patience with my cheeky submission! A great competition, marvelous entries, a wise judge, and a worthy winner. You have to love this forum!